George Lambert had earned a reputation as a portrait painter in London in the prewar years. Many of his subjects were notable women, and in depicting them Lambert particularly enjoyed the pageantry of costume and colour, often inserting his sitters into compositions inspired by baroque or 19th-century masterpieces. By comparison, his portrait of Helen Lawson - a volunteer British Red Cross Society nurse who served in London during the war - is relatively subdued. Her inward-clasped hands were an affectation Lambert had begun to explore with his sitters, but Lawson's self-conscious smile almost makes a mockery of this mannerism. 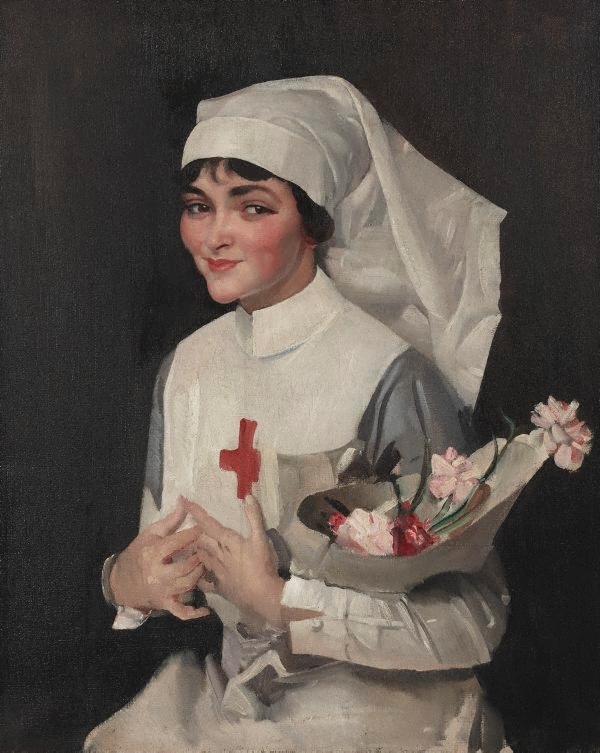 Lambert's portrayal of the young nurse in her uniform is a recognition of the important home-front roles played by women during the war. Signed and dated l.l. corner, brown oil "G.W. LAMBERT/ 1915.". 150 years of Australian art , Sydney, 1938. Masterpieces of Modern Art , London, (colour illus. ).